Illiteracy is the mother of all issues as it gives birth to many other issues like poverty, unemployment, child labour, female foeticide, population burst and many more. It is very hard to digest that the land of the Vedas India, is one of the countries with the highest illiteracy rate. In India, even after completing four years of school, 90% of children from poorer households remain illiterate. Teach for India, an organization that believes every child should be in school, says 4% of Indian children never start school, 58% don’t complete primary school and 90% don’t achieve a secondary school education. But there is hope for poor children in the Indian city, New Delhi. Thanks to local shopkeeper Rajesh Kumar Sharma, who set up a school under a railway bridge, after learning that there is no other way for many children living in slums, to get access to education. Education is the biggest right and a weapon for a kid. If they don’t have this then they are doomed for life. As the Delhi Metro from the Yamuna Bank station rumbles every day, something unusual takes place under its tracks. If you are a frequent morning commuter at the Yamuna Bank Metro Station, would have seen small kids rushing under the bridge with bags and books. Like other kids of their age, they are also going to school; however, their school doesn’t have walls or desks, windows or even a name. The bridge acts as a protecting roof in case of rain and three black squares are used as blackboards. 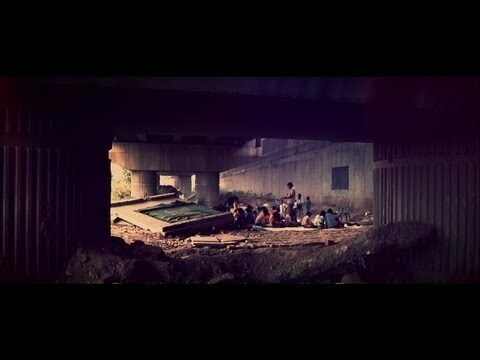 A group of more than 130 children gather everyday under the bridge for two hours of education. This is their informal school, run by their teacher Rajesh Kumar Sharma. Their teacher is a shop owner with no formal training, but he has a strong conviction that education is their only hope. I saw children playing in the mud. Some of the kids were as old as 12 or 14. They were just wasting their time and didn’t go to school. Rajesh Kumar Sharma was forced to drop out of college in his third year due to financial difficulties. One day in 2008, Kumar spotted children playing in the dirt as he walked to the train station. They were the children of construction workers, rickshaw drivers, farm laborers and roadside vendors. These poor workers have migrated to the capital because the opportunities in their villages were even worse. Many of the parents were illiterate and couldn’t even sign their names. When Rajesh asked children’s parents that why they are not sending their children to school, they complained that the school was too far and their children would have to cross a dangerous highway to get there. Rajesh Kumar Sharma didn’t want any other children to face the same difficulties he had faced. He eventually allured local laborers and farmers to allow their children to attend his school instead of working to add to the family income. The next morning, he came back to teach his first lesson to five excited children. Within few weeks, there were 140. Rajesh Kumar Sharma’s greatest achievement is changing the attitude of his student’s parents. Now, many of them encourage their children to study. He starts with the basics and helps prepare the children for admission to government schools. When Rajesh Kumar Sharma started the school a year ago, he had 140 students. Now 70 of them are in government schools. He teaches maths, reading and writing and provides all learning materials for free. The initiative that was Sharma’s brainchild gradually got the support of three more teachers. Despite being busy with their respective professional pursuits, all the volunteers regularly devote time for these classes. Rajesh Kumar Sharma’s school, which has been featured on the RYOT website, may be under a bridge, among the dirt and garbage, but he intends to keep teaching until a proper school is built. With some more external support from civil societies and government agencies, Rajesh Kumar Sharma and his team hope to create even a bigger impact for the underprivileged children. I understand that the Government can’t build a school here right now, I am not naive, I know that. But I dream we will get a small school where all the kids who live here can study. Want to offer a helping hand towards Rajesh Kumar Sharma’s noble task? Please visit the Facebook page Free school under the bridge in Delhi for more details. Its a story of strong determination of MR. Rajesh K Sharma nd i give him a grand salute on his selfless job..